Hermeros (Eros in the form of a herm), 2nd century AD, at the entrance to the Ephesus Museum, Selçuk. including opening times, see page 4: sightseeing in Selçuk. 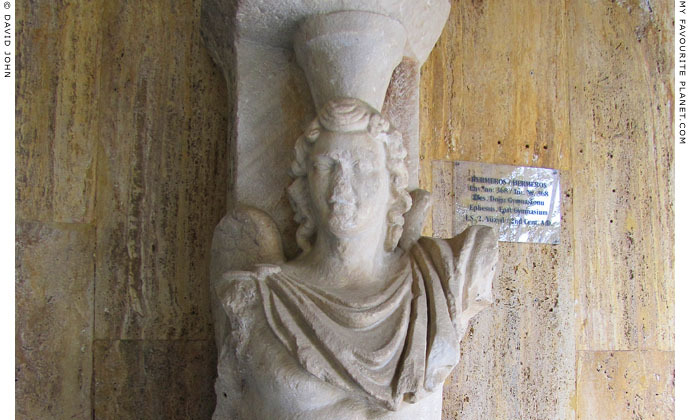 The winged Hermeros , wearing a chlamys (short cloak) around his shoulders, was discovered in 1926 by the Austrian archaeologist Josef Keil  at the nymphaeum (monumental fountain) near the the Upper Agora of Ephesus, south of the street to the Magnesian Gate. The figure decorates a grey marble supporting pillar which was built into a wall of the 22 metre long nymphaeum, commissioned by Tiberius Claudius Aristion and his wife Julia Lydia Laterane. The couple also financed the builing of the Trajan Fountain (Nymphaeum of Trajan, around 102-114 AD) on Kuretes Street, . The site of the find lies outside the upper entrance of the Ephesus archaeological site, and is now beneath the modern road to the House of the Virgin Mary (Meryemana). Total height of the pillar 199.5 cm. The Hermeros in full length. 1. Hermeros or hermerōtis; plural hermerotes (Greek, Ἑρμέρως or Ἑρμῆσ-Ἔρως). A herm (or herma; Greek, Ερμές, ermes) was a tall, square-sectioned stone or bronze pillar, known as the shaft, often tapering to the base, on which was set the head or bust of a god, usually Hermes, or famous mortal (e.g. Socrates, Homer). See for example, herms of Hermes on Pergamon gallery 2, page 15. A hermeros is a herm representing Eros. Hermerotes are quite rare, and seldom mentioned by ancient writers. Pliny the Elder mentioned one in a list of other works of art (The Natural History, Book 36, Chapter 4). It has been suggested by modern scholars that hermerotes had a particular political-religous significance in the Roman Empire, alluding to the relationship of an official to the Emperor: the offical being the Emperor's Hermes (Mercury) as local representative/messenger and Eros (Amor) as promulgator of the subjects' love for him. 2. Josef Keil (1878-1963) was an Austrian historian, archaeologist and epigraphist, born in Bohemia (today the Czech Republic). He undertook several excavations in Turkey, particularly Lydia, for the Österreichisches Archäologisches Institut (of which he was later Director, 1949-1956) before and after World War I. He led the Ephesus campaign 1926-1935, and returned to continue working as an advisor there after World War II, under the direction of his former student Franz Miltner (1901-1959). Bericht über eine Reise in Lydien und der südlichen Aiolis, ausgeführt 1906 im Auftrage der Kaiserlichen Akademie der Wissenschaften. With Anton Ritter von Premerstein and Paul Kretschmer. Hölder, Vienna, 1908. Ephesos. Ein Führer durch die Ruinenstätte und ihre Geschichte. Hölder, Vienna, 1915; 5th edition 1964.
at Forum Archaeologiae - Zeitschrift für klassische Archäologie, 14 / III / 2000. Tiberius Claudius Aristion was a wealthy, influentual and apparently popular citizen of Ephesus during the end of the 1st and beginning of the 2nd century AD. 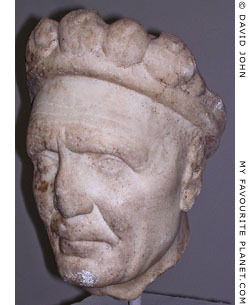 He financed many public works in the city, including a water conduit, a 40 km long aqueduct (102-114 AD), the Temple of Domitian, the first Neokoros temple for the Roman Imperial cult in the province of Asia to be built in Ephesus, the Trajan Fountain (Nymphaeum Traiani) built 102-114 AD, as well as the nymphaeum (built around the same time) near the Upper Agora where the hermeros was discovered. He also partly financed most of the construction of the harbour complex and the Porticoes of Verulanus (90-110 AD), built at the end of the first century AD, during the reign of Emperor Domitian (81-96). He was named executor of the will of Tiberius Julius Celsus Polemaeanus (Τιβέριος Ιούλιος Κέλσος Πολεμαιανός), and was involved in the building of the Library of Celsus, which was designed as a tomb and heroon for the deceased former Proconsul of Asia. After the death of Celsus' son, Gaius Julius Aquila, Aristion took over the building of the library which was completed around 135 AD. Aristion held several prestigious civil and religious offices in the city, including Prytanis (member of the Prytaneion), Neokoros (warden of the temple of the imperial cult) 89-91 AD, Asiarch (High Priest of Asia) three times, secretary of the demos 92/93 AD, and gymnasiarch. Julia Lydia Laterane, Aristion's wife, also served as Prytanis and Priestess and Daughter of Asia. Because of his position as High Priest and temple warden, recent theories have attempted to identify him as the official who calmed the riot at the Temple of Artemis during Saint Paul's time at Ephesus (New Testament, Book of Acts, Chapter 19, Verse 35). It has also been suggested that the head in the Ephesus Museum known as the "Philosopher King" (dubbed by the Austrian archaeologists "der Kaiserpriester", the Emperor Priest) may be that of Aristion (see photo, right). Hilke Thür, Porträt eines Kaiserpriesters und Mäzens aus Ephesos (in German). Forum Archaeologiae, Zeitschrift für klassische Archäologie 7 / VI / 1998. Hilke Thür, The processional way in Ephesos as a place of cult and burial, in Helmut Koester (editor), Ephesos, metropolis of Asia, pages 157-187. Harvard Theological Studies 41. Harvard University Press, 2004. A portrait of Tiberius Claudius Aristion? head on gallery 2, page 9.